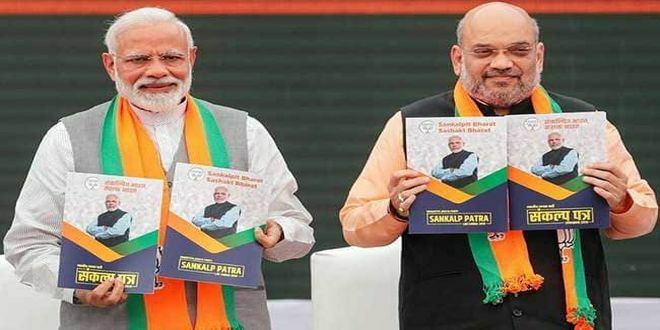 New Delhi: Ahead of Lok Sabha elections 2019, on Monday (April 8), Bharatiya Janata Party (BJP) released its manifesto or Sankalp Patra, a document promising good governance, security, and prosperity in the country. Along with its focus on issues like terrorism, doubling farmer’s income, education, and health of the citizens, eliminating corruption, women empowerment among others, the manifesto paid attention to the ‘swachh’ concerns that play an essential role in an individual’s health. Along with boasting about its achievements under Swachh Bharat Abhiyan, the BJP manifesto highlights the government’s focus on other areas of national interest – air pollution, menstrual hygiene, Ganga cleanup, and others. The clean India campaign or Swachh Bharat Mission which kick-started on October 2, 2014, has witnessed the construction of over nine crore toilets. If elected, the new government plans to take the mission to a new level through sustainable Solid Waste Management in every village, 100 per cent disposal of liquid waste with emphasis on faecal sludge management and reuse of wastewater. We will ensure that all habitations attain open defecation free (ODF) status and those that have attained the status sustain the behavioural change, reads the manifesto. The rising levels of air pollution and poor air quality prevailing in various regions of the country has been the talk of the town. Taking that to account, the BJP manifesto puts its focus on bringing down levels of air pollution with evolved technologically better strategies and devices to map the level of pollution in cities. The party also aims at converting the National Clean Air Programme (NCAP) – a plan to improve air quality in 102 cities by 20 to 30 per cent by 2024, into a mission. Through concerted action, we will reduce the level of pollution in each of the mission cities by at least 35 per cent over the next five years, states the manifesto. As part of the party’s plan to empower women, the aim is to ensure easy access and availability of all reproductive and menstrual health services to women across India. The government also plans to expand ongoing Suvidha scheme – that provides 100 per cent oxo-biodegradable sanitary napkin (a special additive in the suvidha napkin makes it biodegradable when it reacts with oxygen) at a cost of Rs. 2.50 per sanitary pad, and provide sanitary pads at an affordable cost of just Rs. 1. The party wants to make India a world leader in electric mobility (e-mobility). To accelerate manufacturing, adoption and use of electric vehicles in the country, the central government has already allocated Rs. 10,000 crores under Faster Adoption and Manufacturing of Hybrid and Electric Vehicles (or FAME II) scheme. The government plans to further work on this sector. The plan is also to take up ODF villages located on the banks of the river, under a special project to ensure sustainable management of solid and liquid waste.